If you have been reading this blog for awhile, you know that my stand on e-book readers has softened from “firmly…staunchly…against”, to “I understand that the stories (and authors) are not going away”, to…. Well gee…..I now have the Nook !! Was I enthusiastically looking forward to firing it up and using it (like a kid at Christmas)….errr, no. Was I glad to get it for Fathers Day? You bet. I’m not going to review it here (or on my TelBitConsulting technical blog) but I will say I have had fun this morning playing with it a bit. I turned it on and was connected to Barnes & Noble web site. I logged on to our account and the Nook was magically registered. WAIT…how did that happen? My wireless requires a password….oh yeah, the Nook has free 3G. Wow, cool. Lacking a WiFi “hotspot”, the 3G kicks in (which I suspect could come in handy at the beach). 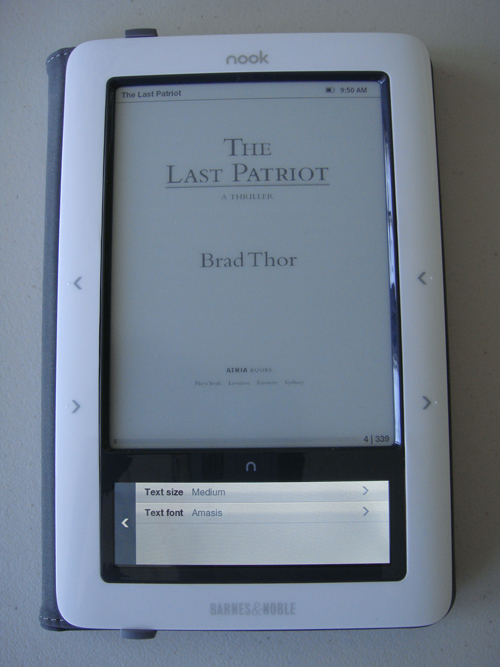 I then connected the Nook to my home wireless with the required password…it worked great, the first time. I also found out that I had to enter my credit card number to buy a free book. Buy a free book, how funny. Looking a the functions, I was impressed. I could load my MP3 country music to the Nook (a spot for headphones and a tiny speaker that actually sounds ok), there is a beta version of web browser, there are two games, and places where I can see my documents or buy stuff. Again the Nook connected via 3G until I connected it to AltamontCowork’s WiFi (again requiring a very strong password). I found that I like looking at the book covers on the bottom color portion. I can swipe the covers over (like you can do on an iPod, etc) and then click on the book that interests me to read an overview. When in the overview, you can order it, put it on your wish list, or grab a free sample. Cool. I paid 50 cents for todays copy of the San Jose Mercury News (newspaper). Although I am still getting used to the navigation, it was interesting. I read several articles. AltamontCowork member Phil shared a book with me…”B” is for Burglar” by Sue Grafton. I had the option to accept it or not. Since I have already read it, I did not accept. Sweeet. I plugged the Nook into my trusty Toshiba laptop’s USB port and instantly saw the external hard drive of the Nook. I dragged over some pictures (photos) and a PDF file. Interestingly, the PDF file was a drawing but only the words came thru…a bug?!! But the photos (although in black and white) showed up fine. I have a ton of real books to read. However, I will tote the Nook with me to work and on Friday nights to Barnes and Noble to see how it works….I am looking forward to reading my first e-book on it, but, it may be a few books from now before I get that chance.